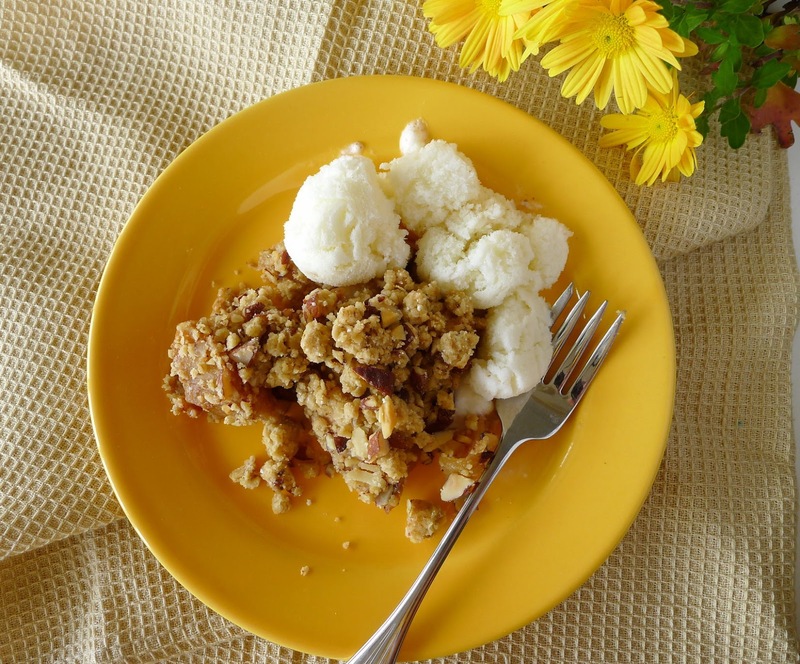 Choose several apple varieties for making this dessert. I can’t believe there’s NO butter! Cakes, pastries, cookies—all made with extra virgin olive oil as the only fat. Yes! For several years now, the only fat I use in my kitchen is olive oil. No butter, no vegetable oils, no lard. Why? For me, it’s a way of affirming my Mediterranean lifestyle. I pick my own olives, bring home the oil. Plus, I know how healthful olive oil (a mono-unsaturated fat) is. And, personally, I love its flavor. At the beginning of my conversion, it was easy to switch to olive oil in cooking. Olive oil is splendid in sauces, drizzled on vegetables (or popcorn), for sautéing, for stir-frying, for deep frying. But, when it came to baking—birthday cakes and Christmas cookies—I reverted to butter. Spanish cuisine—especially that of Andalusia, southern Spain, where olives are cultivated—has a long and respected history of preparing pastries with olive oil. But, I wanted to bake the American pastries that I grew up with (I’m from midwest America). 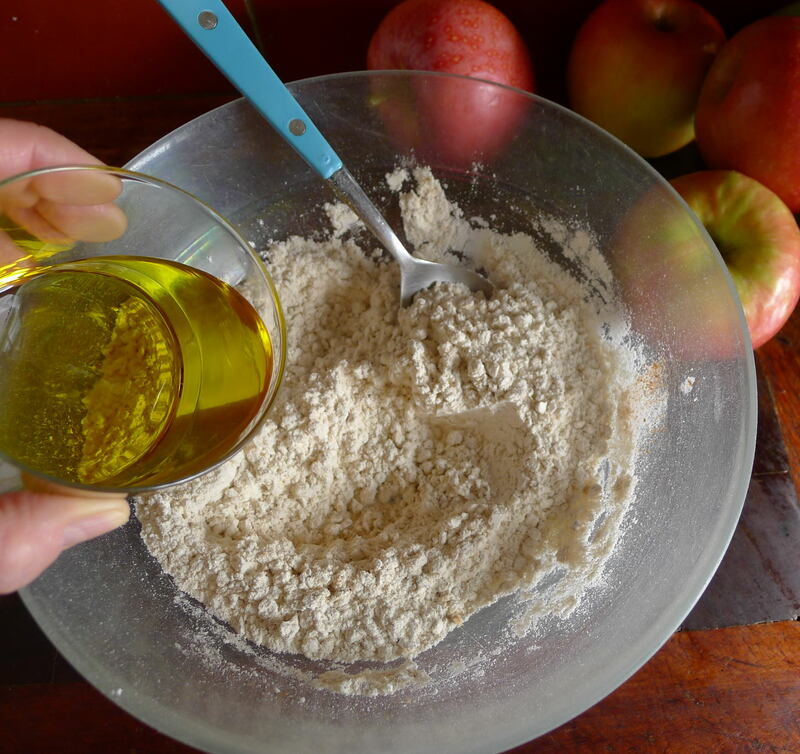 Olive oil, flour and oats for apple crumble. One day, making an old favorite recipe for Carrot Cake, which calls for “vegetable oil,” I realized I had no vegetable oil other than olive. I made the cake with olive oil and it was so delicious nobody noticed anything unusual. Since then, I’ve elaborated on the recipe only slightly—I add grated orange zest and grated fresh ginger along with the usual cinnamon to complement the fruitiness of the oil. Even though Carrot Cake is one of the most ubiquitous of cakes, people ask me for my recipe because it has something special. Next, I experimented with olive oil pie crust. It has a crisp and crackly texture, very appetizing, although different from a “flaky” one. Best of all, it is easy, easy and exceptionally good with fruit pies. Here too, I might add an inflection of aniseed or sesame as a complement. Since then I’ve substituted olive oil for butter in all sorts of recipes for baked goods. I like it best with anything with fruit, especially citrus, or spice or chocolate. The basic substitution is ½ cup olive oil for 1 stick of butter. But, in fact, because olive oil is liquid and butter congeals, it’s better to use less oil in proportion to butter in any recipe. 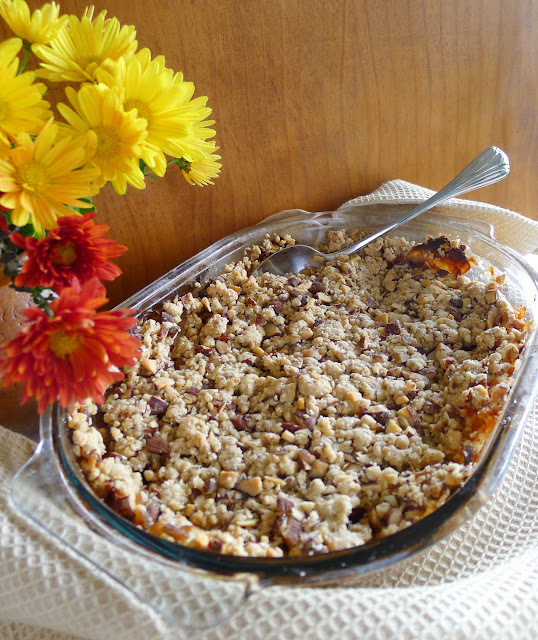 Sweet apples and a crumbly topping with almonds, good hot or cold. Here’s an interpretation of old-fashioned Apple Crumble, using olive oil. I made this for dessert on Thanksgiving and it was a hit. The apple crumble is good served hot or cold, accompanied by ice cream. I served it with leche merengada, cinnamony iced meringue milk. That recipe can be found here. Crumbly almond-oat topping with sweet apples and cinnamony ice cream. 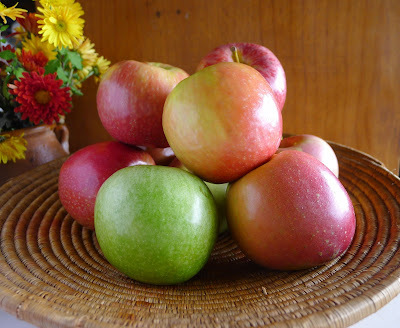 Use two or more varieties of apples, such as Gala, Granny Smith, Fuji, Pink Lady. If you’re preparing this as part of an oven meal, the crumble can bake alongside a roast chicken at 350º or by itself at 425º. Adjust the baking time up or down. You may like this dessert more or less sweet, so taste the apples as you add the sugar. Personally, I like it less sweet. Combine the flour, oats, sugar, cinnamon, cloves and salt in a bowl. Add the olive oil and stir with a fork until the mixture is crumbly. Stir in the chopped almonds. Stir to break up clumps to pea-size bits. Peel and core the apples. Slice them thinly. Combine in a bowl with the lemon zest, juice, flour, cinnamon, allspice, ginger and sugar. Spread the apple mixture in an oiled 12-inch baking dish. The apples will shrink as they bake. Use the fingers to crumble the topping mixture on top. Pat it down gently. Bake until apples are bubbling and topping is golden around the edges, about 50 minutes. Serve hot or cold. 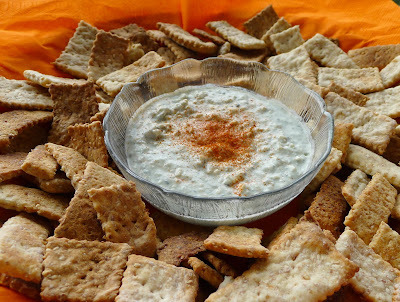 Crunchy sesame-wheat crisps with blue cheese dip. Most of the dishes will be classic North American (minus fresh cranberries, which I cannot find in Spain). Sweet potato “soufflé,” roasted Brussels sprouts and little onions; chestnut stuffing; apple pie. But, I couldn’t prepare a holiday meal without a little Spanish flavor. If Thursday is a sunny day, the starter will probably be a Spanish-inflected salad with jewel-like pomegranate and clementines picked from my own tree. If it’s rainy and chill (like today), I’ll opt for a soup, perhaps pumpkin (prepared with oregano and a touch of vinegar, as in this recipe). Crispy crackers with sesame and olive oil. For sure, I’ll serve fino Sherry or Montilla-Moriles as an aperitif, along with my home-cured manzanilla olives. And, I’ve just made a batch of regañás, sesame-wheat crisp crackers, to serve with Cabrales blue cheese dip. 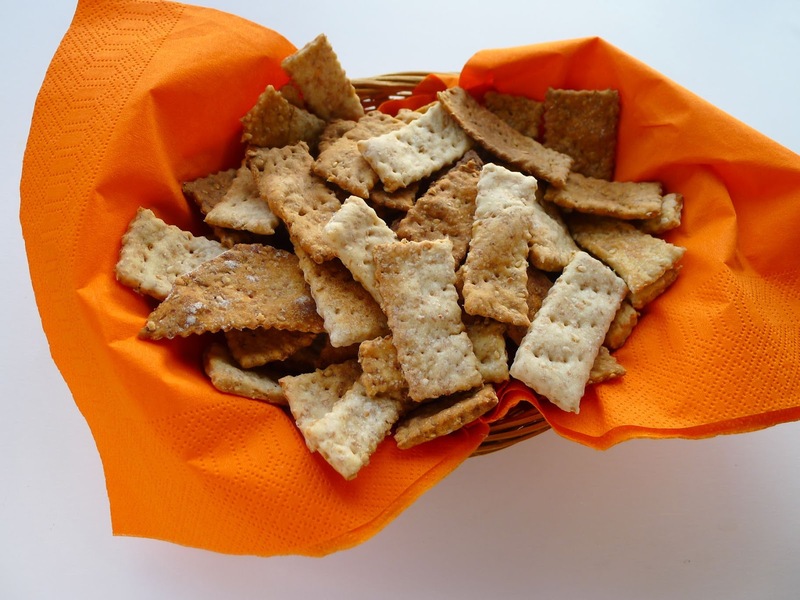 These crispy crackers, popular at tapa bars in Sevilla and Cádiz, are seriously addictive! They’re good all by themselves or as dippers for sauces. They keep well stored in an air-tight container. In Spain, I can buy regañás in packets. But they are ever-so-easy to make. Get the kids to knead the dough and roll them out. Because the crackers keep well, you can make them days before the holiday. Roll the dough as thinly as possible. After rolling it out and cutting, pop the trays right in a preheated oven. If you leave them to set, the dough will rise again and the crackers will not be so crisp. Makes about 200 small crackers. Combine the yeast and sugar in a small bowl. Add 4 tablespoons of the hot water and stir to dissolve. Allow to stand until bubbly. 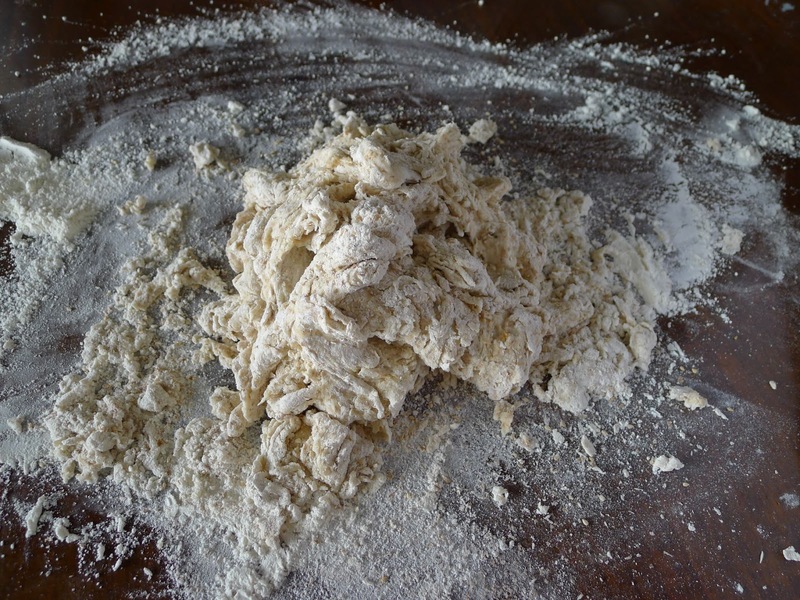 Combine the two kinds of flour in a bowl with the salt , sesame seeds and herbs, if using. Make a well in the center and add the yeast, oil and remaining hot water. Use a wooden spoon to mix the dry ingredients with the wet. Dough starts out really rough and shaggy. Turn out on a board and knead the dough. It will be rough and shaggy at first and gradually become smooth and glossy, about 4 minutes. Clean out the mixing bowl and oil it generously. Gather the dough into a ball and turn it in the bowl to coat with oil. Cover with a damp cloth and place in a warm place until doubled in bulk, about two hours. Punch down the dough. Divide it in four pieces. Place one piece on a lightly floured board. Roll it out very thinly into a roughly rectangular shape. Transfer the dough to a baking sheet. Prick the dough all over with a fork. With a pastry wheel or sharp knife, cut the dough into strips 1 inch wide. Cut the strips crosswise into 2 inch- pieces. Bake the strips until browned on the edges, 10 to 12 minutes. Repeat with remaining dough, rolling out, placing on baking sheet, cutting. Allow the crisps to cool completely before storing in an air-tight container. Cabrales is a distinctive blue cheese from Asturias—sharp, but remarkably creamy in consistency. It makes a delightful dressing or dip when thinned with wine or, in the Asturian style, dry cider. Serve the sauce with endive leaves for dipping; with charcoal-grilled steaks or spooned over a salad of frisée, sliced pears and toasted almonds. 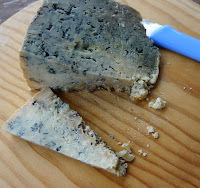 Other blue cheese can be substituted. Makes 2/3 cup of sauce. Place the cheese in a blender or mini processor with onions, wine and cumin seed. Blend until smooth. Serve immediately or keep, covered and refrigerated, up to 3 days. Serve garnished with a pinch of pimentón. 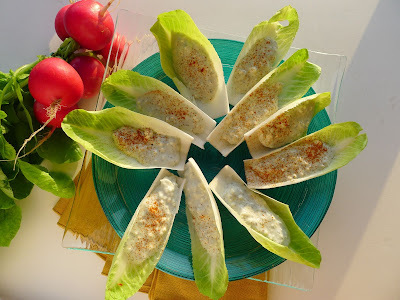 Endive with Cabrales blue cheese dip. 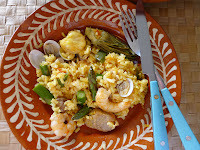 Favorite blog is about cooking in cazuela. Raise a glass of cava (Spanish bubbly) with me to toast an anniversary—it’s three years since I started this blog, MY KITCHEN IN SPAIN. My first couple of posts were experimental, as I learned how to use the Blogger template and wrestled with uploading photos. My “official” “Welcome to My Kitchen in Spain” blog appeared November 28, 2009. Finding a voice, choosing subjects that interest first me, then you, the readers; testing and formatting recipes, and, especially, learning to take photos of food all continue to challenge me, engross me every week. The fun part is doing what I’ve always enjoyed about food writing—cooking and tasting and talking to people about what they eat and how they cook it. I’m a reporter at heart and blogging is a great way to keep a hand in. After years of writing about Spanish food, I’ve gathered a lot of information and thousands of recipes. Here’s where I can share that knowledge with many more people than those who read my cookbooks or magazine articles. Traffic to MY KITCHEN IN SPAIN has grown steadily over three years. Google.com, Google UK, Google Canada, Google Australia and Google España account for far and away most of the referrals. Top links were from Stumbleupon, the Los Angeles Times after my stories appeared in the food pages of the paper (thanks Russ Parsons), and LeitesCulinaria. Where are you, the audience? The US leads readership by a lot, Spain is second. After that it’s other English-speaking countries—UK, Canada and Australia. But, then, Russia. I cannot fathom why I have such wide readership in Russia! Then Germany, France, India and the Philippines. And now for the top five blog posts: in fifth place, Bitter Oranges--Mouth-Puckeringly Delicious ; fourth, This Gazpacho Is Hot; third, How to Lower Your Cholesterol WithoutMedication, which doesn’t really have much to do with Spanish cooking; second, Five Star Seafood Soup; and, drum roll, please, número uno, Clay Pot Cooking, Cazuela Edition. My welcome page also gets a lot of traffic (link to it by clicking on the photo of me at the left). I welcome your comments and questions. 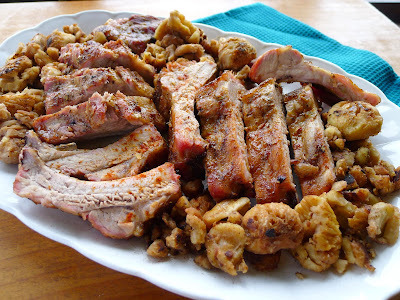 I'm fascinated to know what you, the readers, want to know about cooking in Spain. To celebrate this anniversary, here’s another post on clay pot cooking, cazuela edition. Refer to the original post for everything you need to know about cooking in earthenware. 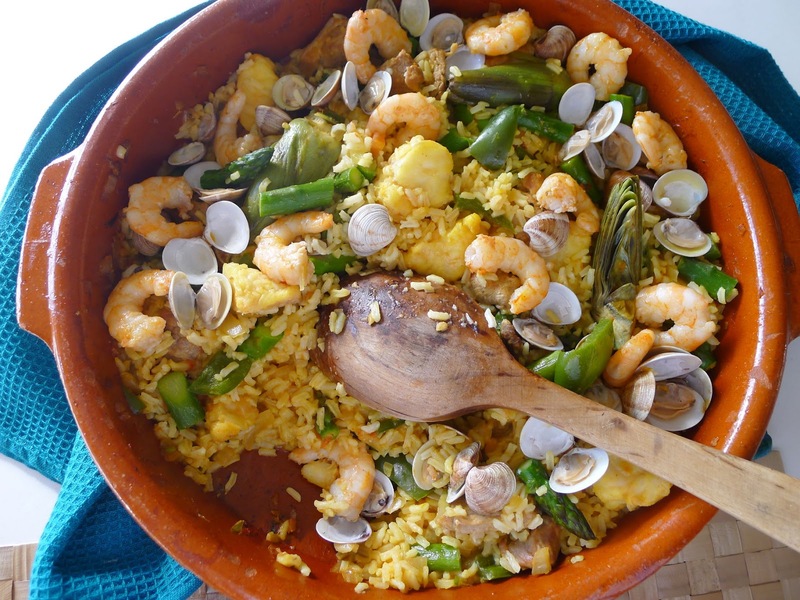 Rice, pork, seafood and vegetables cooked in a cazuela. It’s a paella if you cook it outdoors in a metal paella pan. 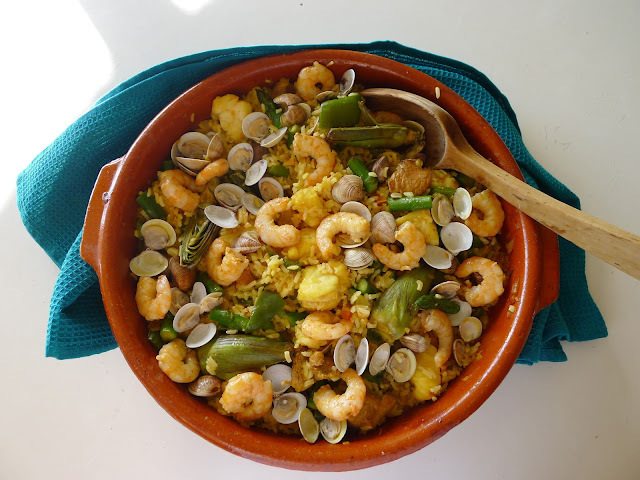 It’s un arroz, merely a rice dish, if you cook it in the kitchen in a cazuela. If possible buy unshelled shrimp, as the shells and, especially, heads add flavor. Use Spanish round-grain rice for this dish. If not available, Italian arborio is a possible substitute. Saffron and pimentón flavor the rice. Wash the clams in several changes of water. Put them in a pan with ½ cup of water. Cover and cook the clams just until shells open. Remove from heat. Reserve clams. Strain the broth and reserve it. Shell the shrimp, reserving the shells. You can use the shells to make a stock, along with any fish trimmings. Or else sauté them in hot oil to flavor the oil. Heat the oil in a 12-inch cazuela. Add the shrimp shells and sauté them until they turn color. The shells flavor the oil. Scoop them out with a skimmer and discard the shells. Now sauté the shrimp in the same oil. Remove them when they are pink and reserve them. Add the pork to the pan and fry it until browned on all sides. Stir in the onion, green pepper and garlic. Sauté 5 minutes. Stir in the pimentón, then add the tomato. Mix the crushed saffron in ¼ cup hot water. Pour into the cazuela. Add salt (about 2 teaspoons, unless you have heavily salted the stock) and pepper. Trim ends off asparagus, cut stalks into 1-inch pieces and add to the cazuela. Remove outer leaves from the artichoke and cut it into quarters immediately before adding to the pan. Add the pieces of monkfish. Combine the reserved clam broth with water or stock to make 4 cups liquid. Add to the cazuela and bring to a boil. Stir in the rice. Bring again to a boil, then reduce heat so liquid bubbles gently until rice is al dente tender, about 18 minutes. Arrange the clams and shrimp on top. Remove cazuela from heat and allow to set for 5 minutes before serving. Such a cheery sight on a dreary evening—the guy in the plaza roasting chestnuts over hot coals. When a batch is ready, he scoops the fragrant nuts into paper cones and hands them to you. 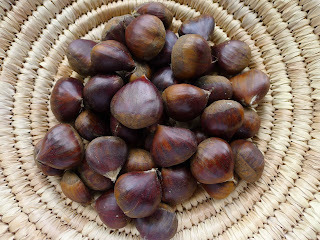 You pick up a chestnut and warm your hands, before peeling and eating the toasty nut. Chestnuts are a seasonal pleasure. Appearing just in time for the November 1 holiday of Todos Los Santos, when families visit cemeteries to pay respect to the dead, chestnuts are sold by vendors outside the cemetery gates. 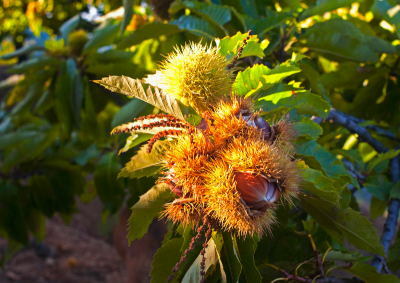 Chestnut trees grow in northern Spain and in mountainous regions of the south, such as the Serranía de Ronda, Sierra de Aracena and the Alpujarra. On the tree, chestnuts are encased in a prickly outer husk. Each chestnut has a smooth brown shell and an inner light brown skin. The nut meat is an ivory color. For roasting on an open fire, cut a slit into the shell of each and place them on a grill over coals. In Spain, they use a cooking pot with holes punched in its bottom to set over coals. To eat them, use your fingers to pull away the shell and the skin. 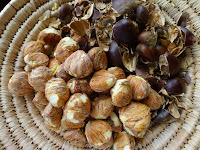 Looking for a different way to prepare chestnuts, I went to a Galician cookbook, as Galicia (northwest Spain) is real chestnut country. The classic book, Cocina Gallega, by Álvaro Cunqueiro (I mistakenly bought the book in the Galego language, different enough from castellano, Castillian Spanish, that I had to buy a dictionary in order to use it), lists 17 different chestnut recipes, about half sweet and half savory. 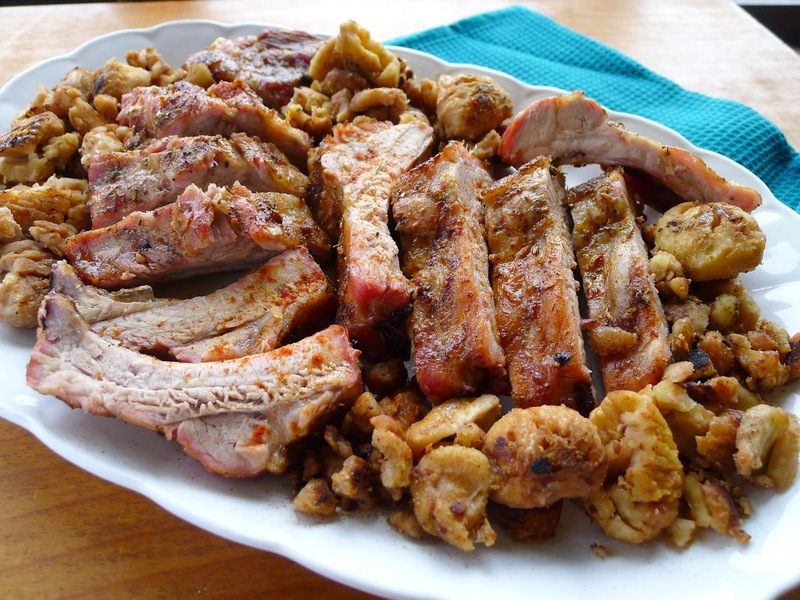 In this recipe for pork ribs, the chestnuts take the place of potatoes alongside the meat. 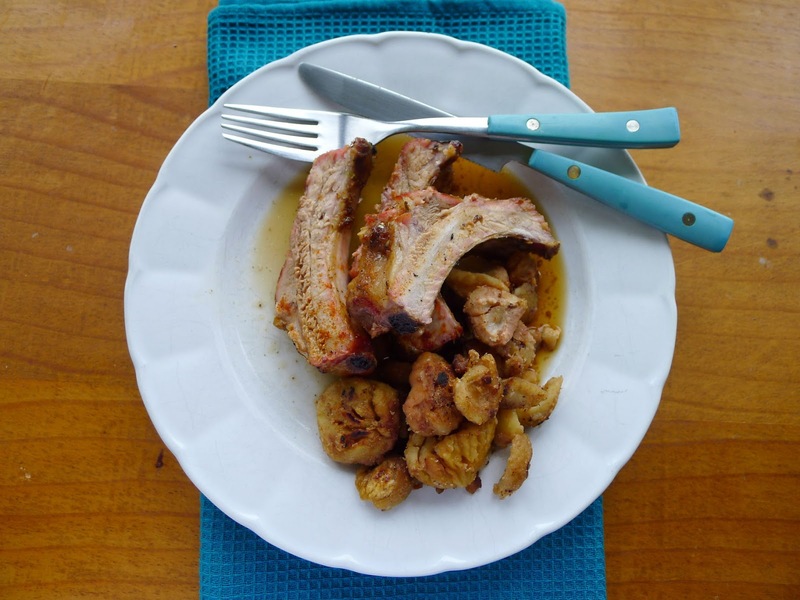 Juicy ribs and toasty chestnuts for a warming fall meal. Shelling chestnuts is more like peeling an orange than cracking a nut. Cut into the outer shell then peel it away in strips. The chestnuts are cooked, then the inner skin peeled off while they are still warm. 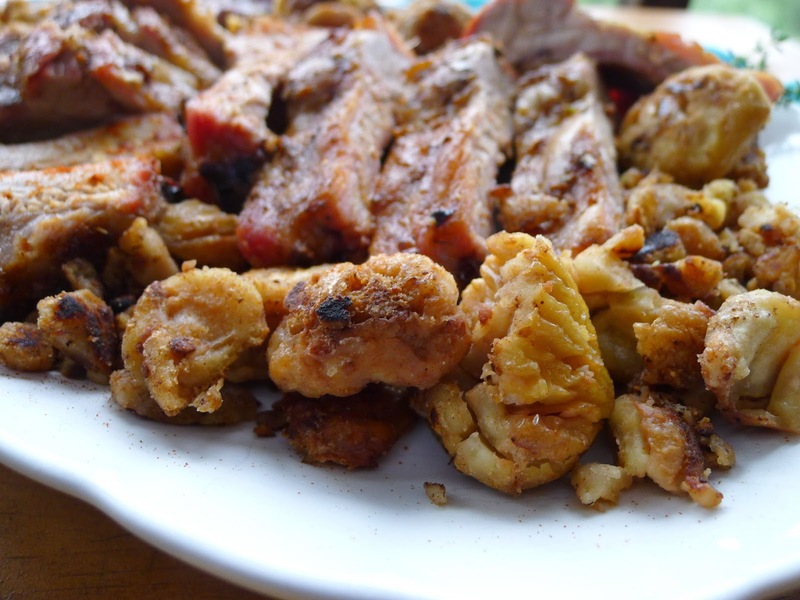 This adobo is an aromatic rub for the pork ribs. Herb-rubbed ribs roast until tender. 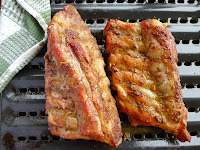 Place the ribs in a pan large enough to hold them. In a mortar or blender, grind together the salt, garlic, bay, thyme, pepper, pimentón and fennel. If using a blender, add the olive oil with the spices. If using a mortar, stir the oil into the spice blend. Spread this mixture on all sides of the ribs. Allow to stand at room temperature for 1 hour or, covered and refrigerated, up to 8 hours. Bring to room temperature before proceeding. Preheat oven to 350ºF. Place the ribs on a rack in a roasting pan or on a broiler pan. Mix the wine with ½ cup of water and pour into the bottom of the roaster. While meat is roasting, add more water from time to time so that there is always enough liquid to cover the bottom of the roasting pan. Roast until ribs are tender, about 1 ½ hours. While meat is roasting, shell the chestnuts. Cook them in boiling water for 30 minutes. Drain. While still warm, remove the brown skin. Shortly before serving, heat the butter and/or oil in a skillet and brown the chestnuts. Remove ribs to a cutting board and slice them. Serve on a platter with the browned chestnuts. Pour over any pan juices. Browned chestnuts substitute for potatoes alongside roast meat.